Small two-inch tile turned out to be the perfect finish for our window sill. The window has a nine-inch space almost ten-feet long. The project is a viewing area of an indoor horse arena. We choose a small tile in order to enhance the colored grout line. 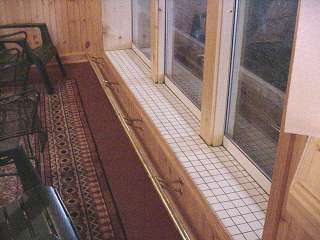 While the brass railing helps prevent viewers from resting their dirty riding boots on the window sill, we wanted an easy to clean and durable surface. We selected an near white tile with dark green grout. The light-colored tile accents the pine paneling and matched the painted white window trim. The dark green grout matches the wrought iron furniture. Cut tile edges can be very sharp.